The consortium for research on Enhancing Carbon Sequestration in Terrestrial Ecosystems (CSiTE) is a multi-institutional research effort involving Argonne, Oak Ridge, and the Pacific Northwest National Laboratories and partnered Universities. Established in 1999 and sponsored by the Climate Change Research Division (CCRD) of the Office of Biological and Environmental Research within the U.S Department of Energy’s Office of Science , CSiTE’s goal is to identify potential approaches for enhancing terrestrial carbon sequestration as a partial mitigation of CO2-induced climate change. CSiTE is part of the Climate Mitigation Science Focus Area of CCRD and supports the strategic plan of the US Climate Change Technology Program. CSiTE is founded on the premise that identifying and understanding the fundamental physical, chemical, biological, and genetic mechanisms controlling sequestration is crucial to protecting stored carbon and enhancing carbon accrual. CSiTE has from its inception taken a holistic multi-scale approach investigating processes from the molecular to the national scale. Figure 1. Investigating carbon sequestration processes across multiple scales. 1. 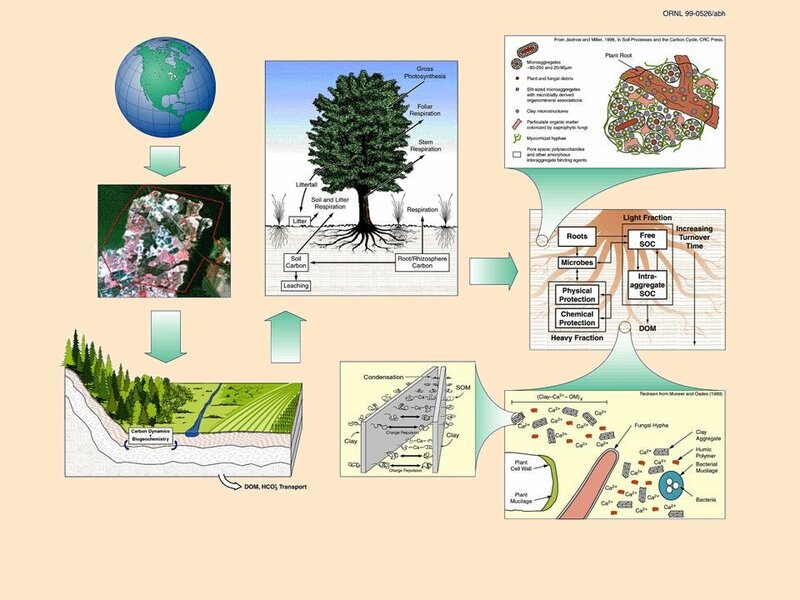 What are the physical, biological and chemical processes controlling soil carbon input, distribution, and longevity? 2. How can these processes be exploited to enhance terrestrial carbon sequestration? 3. How do terrestrial carbon sequestration strategies relate to and influence other strategies to mitigate climate change? 4. What is the long-term potential for terrestrial carbon sequestration to mitigate climate change at a global scale? In this context, we also seek insight into how soil carbon sequestration is impacted by genetic control of plant litter and root chemistry and address whether genetics can be harnessed to enhance carbon storage in terrestrial ecosystems. These questions are examined in integrated laboratory, greenhouse, and field research to elucidate the processes that control soil carbon inputs and storage, and through the development and use of models capable of extrapolating process-based understanding across space and time. Our results will contribute to the development of sustainable technologies to enhance carbon sequestration and quantify the potential of these technologies for mitigating climate change. Furthermore, because CSiTE utilizes switchgrass and poplar ecosystems managed for cellulosic biomass production as a testbed, CSiTE research findings will have immediate relevance to the scientific advancement of another technology for mitigating climate change – bioenergy.